Happy Solemnity of All Saints! This is one of our favorite feast days of the year because it’s such a consolation to celebrate all our friends in heaven, interceding for us and helping us. And today’s feast reminds us that all of our trials, sufferings and pains, borne with love for Christ, will have an end one day because we are made for life with God in heaven. Fr. Phillips’ homily today gave us food for thought, as he pointed out some things we had never heard before. Making saints is part of the Church’s identity; if she didn’t make saints she wouldn’t truly be the Church founded by Christ. And the marks of the Church – she is one, holy, Catholic, and apostolic – are also the character of the saints. 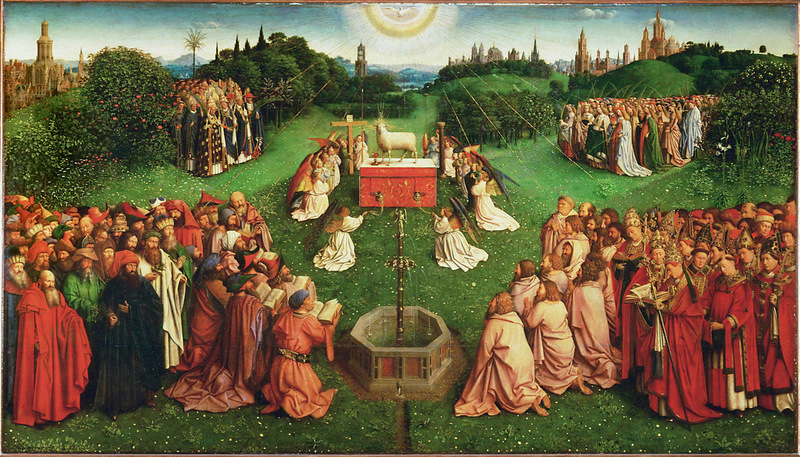 One: the communion of saints are united with each other because they are united with Christ. Holy: the saints are holy; that’s what “saint” means, after all. They fully grasped God’s grace on a daily basis and were transformed into His likeness. Catholic: Catholic means universal. Holiness is the same at all times, in all places; this standard doesn’t change because it was given us by Our Lord, and His model for holiness will never change because He is unchanging. All the saints confessed the same faith throughout the ages; the same faith for which the martyrs died is the same faith which we profess today, and which we hand on to future generations. Apostolic: apostolos means “to commission” or “to send forth”. The lives of the saints were apostolic. They were living Gospels who shared the faith with the world by the witness of their lives. Their holiness was not for themselves, not something to be hoarded or to benefit themselves alone, but it was for the whole world, and for all times and people. Even the most hidden saints, the ones whose names we will never know, made an impact on the world with their holiness and prayers which we won’t fully understand until we get to heaven. Call upon the saints, they are powerful and they’re always ready to help us. Every year on this day we draw a saint’s name at random and invoke their help throughout the year. It often gives us an opportunity to learn about someone new. They say the saints choose you, so why not let a saint choose you today? Click here to go to Jennifer Fulwiler’s Saint’s Name Generator. This entry was posted in Saints & Angels and tagged All Saint's Day, Four Marks of the Church, Sain'ts Name Generator by texasnuns. Bookmark the permalink.